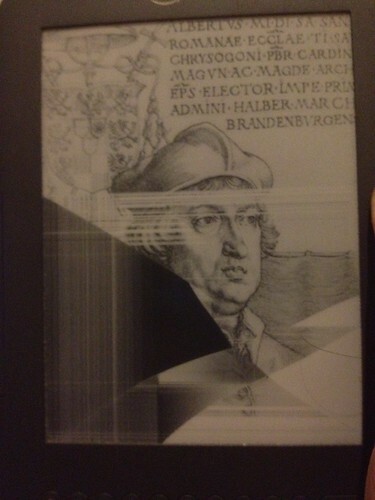 If you own a Kindle, you will be aware that the screensaver image isn’t supposed to look like this. This is how I found my Kindle 3 (or, as we’re supposed to call it these days, Kindle Keyboard), late last night. A frozen mass of e-ink visual glitch. It’s actually kind of interesting-looking. Unless you want to read a book. And I was looking forward to a long last attack on Iain Sinclair’s GHOST MILK. Flicking the power slider did nothing. Holding the power slider for five seconds did nothing. Holding it for twenty did nothing. A full minute. You get the idea. I put the thing on charge, just in case, and came back to it this morning. It was, as you see, quite buggered, and utterly unresponsive. Dead. An ex-Kindle. What you do, at this point, is go to Amazon (or, in my case, Amazon.co.uk) and go through their help structure. And do all the things again. And then press the button that says Contact Amazon. At this point, I did not have high hopes, and assumed I’d be buying a new Kindle Keyboard at full price. The device had been out of warranty for well over a year. I pressed the button, and gave them permission to call me to (eventually, hours or days after I’d pressed said happy button) discuss what I assumed would be another hundred-odd quid out of my pocket. I was surprised at the instant callback. Less surprised at the customer services person who had to ensure I wasn’t an idiot by making me do All The Things again, and then had me describe what you see above. And then she transferred me to another department. Where someone else had me do All The Things again again. I made her repeat the price again, because I swore I’d misheard it. I hadn’t. The new Kindle is dispatched, being tracked, and will arrive in the morning. The whole process took less than five minutes from pressing the button on amazon.co.uk. * commencing the short revision on GUN MACHINE this week. * receiving interesting emails from Mike Avon Oeming – looks like our schedules are syncing again. * in the distance, tongues of fire emerge from the siege engines of the remote Whedon compound. Also, a weak coughing sound.